The financial services market is undergoing a lot of numerous changes. Customers always have appetite for more and are well knowledgeable, looking for convenience and ease when it comes to financial services, particularly via internet and via mobile phones making innovation and transformation a necessity in banking. As more and more Millennial generation join the workforce and customer experience, digital technologies and innovation will continue to take a greater role in the way that banks function. As a result, banks have to look at technology, product and changes in customer behavior through a prism of being more mobile, more social, more analytical and taking a more diversified view on customer expectation. This 2-day C-Parity event will address the key issues of banking transformation and innovation by bringing on board expert speakers from the industry to address and provide updated information and solutions to the challenges facing the industry. Through case study presentations and panel discussions the event would equally equip attendees with the appropriate strategies to perform proactively in order to stay on top of their business. - How much to invest in IT security and how to earn RoI? - What can banks learn from the other industries regarding their digital transformation journey? and event organizer with European base, and with an ambitious global growth strategy. Corporate Parity works closely with its clients in organizing international conferences, bringing together experts, academics and practitioners from a wide range of disciplines to discuss options and strategies in their individual held. Their international conferences aim to provide our participants with a positive impact and help them achieve efficiency in their daily responsibilities while overcoming any possible challenges. 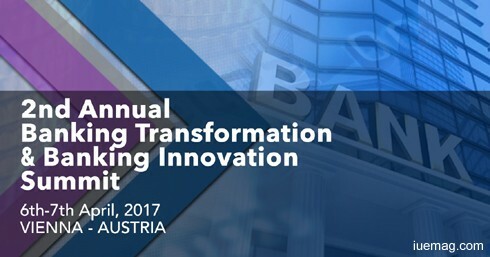 The iUeMagazine team is delighted to work with 2nd Annual Banking Transformation & Innovation Summit as Online Media Partners & is expected to bring Unlimited Inspiration for all readers from the proceedings of this event. Staying tuned to the enriching updates from this event is recommended. Any facts, figures or references stated here are made by the author & don't reflect the endorsement of iU at all times unless otherwise drafted by official staff at iU. This article was first published here on 30th March 2017.